Just getting off the crutches this weekend but my wife has a horrible cold so we're going with a hearty, flavorful, hot soup for a weekend night. Although it's not the traditional Italian minestrone, this one from Deborah Madison was just the right meal for a rainy night just before Christmas. I made a vegetable stock from scratch for this but any poultry or vegetable stock would work, as would water if you don't have any stock available. Heat the stock and keep it simmering while you prepare the soup base. In a large soup pot, add the oil over medium-high heat. When the oil is heated, add the diced onion and cook until golden brown, about 10 minutes. Add the garlic, carrots, and celery along with the parsley and thyme, allowing to cook for another few minutes, to get the vegetables translucent. Pour in the heated stock, then the lentils with some salt and pepper. Reduce the heat to a simmer, cover partially, and let the stock cook until the lentils are soft, about 30 minutes. Meanwhile in another large pot, bring 4 cups salted water to a boil and add the chard to parboil for about 5 minutes. Remove the chard with a strainer and put aside to cool while keeping the water in the pot. Add the pasta to the boiling water to cook for 8 minutes. When the pasta is cooked, strain in a colander and add to the soup. Chop the cooled chard and add to the soup as well. Remove the herb branches. Season with salt and pepper then serve with crusty bread toasted. Very simple and easy to prepare quick side dish, we served these with the Pan-Roasted Salmon Fillet last night, also a very easy dish to prepare. Holding the potato sideways, with a sharp chef's knife carefully slice the potato evenly into very thin chips. (If you're using a mandolin, all the easier to get even thin slices). Coat with 1 tablespoon of the oil, salt, pepper, and minced thyme leaves. Heat the skillet over medium heat. When hot add the remaining tablespoon of oil. When the oil is hot, add the potatoes, occasionally stirring and flipping them around as they cook in order to get an even brown color. Once they get a nice color, but before over-cooking them, turn the heat off and allow to sit a couple of minutes before serving. Time for a salmon dinner last night. Since it was raining (and as I'm still on the mend) we couldn't use the grill outside so thought I'd employ the same technique to cooking it that I used on the black cod a few weeks ago and simply pan-roast it. This turned out to be quite an easy and simple way to prepare a salmon fillet and have it come out so delicious. In fact so easy that's it already made its way onto my list for beginner classes. 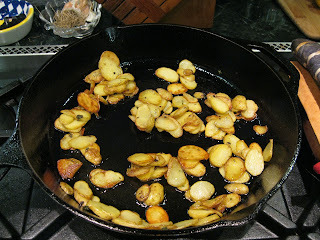 We paired it with slim-cut pan-fried fingerlings and steamed cauliflower, both of which are very easy and simple dishes and, like the salmon, also quite delicious. Loch Duart salmon fillet - beauty, eh? Lay the salmon out on a board and use a pair of needle-nose pliers to carefully pull out any pinbones. Coat with 1 tablespoon of the oil then add a pinch of salt and a few turns of a peppermill for seasoning. Put into a bowl with the capers and lemon slices. Heat a medium skillet over medium heat. When hot add the remaining 1 tablespoon of oil. When the oil is heated, add the salmon skin-side down with the capers and lemon slices. Cook for about 3-4 minutes to sear the skin then reduce the heat to medium low and cover the skillet. Allow to cook for another 5-7 minutes, or until the flesh of the fish starts to flake. If you peek inside the thickest part of the fish it should also just be at the point where it is losing its internal redness but no more than that. Remove the fish, capers, and lemon slices, and cover with foil to rest for a few minutes before serving.